Sudan is holding its first elections since the end of the 21-year north-south civil war which saw some four million people flee their homes - one of the biggest and most protracted displacements of people from conflict in recent times. About two million have returned to their homes in the south since the 2005 peace deal. The BBC's Lucy Fleming visited the village of Mathiang Dit in the province of Northern Bahr al-Ghazal, where more than half the population is made up of returnees. Explore this 360 degree panorama of a village gathering and listen to their remarkable stories. 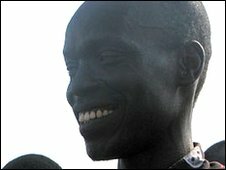 Victor Ngor, 35, deputy village leader, former "Lost Boy"
I'm called Victor Ngor. I'm one of the leaders of the boma (village) Mathiang Dit. I'm 35 years old - I think, I'm not sure. I left my home country in 1986 because we were being attacked by Arabs, they came to raid our cattle - they burn our houses, they abduct people. They killed my father. I ran away. I ran alone, but [then] I got other people who ran also then we go and move together up to Ethiopia. I'm one of the "lost boys". The time I left I was 12 years old and I want to go and join the SPLA (The Sudan People's Liberation Army), so that I look for the gun and fight back to Arabs. But I was told that it's not your time, because I was very small and could not even hold a gun - but I was trained. The time I left Ethiopia - because the president was overthrown, we were chased away. We ran to southern Sudan, we were also be chased by Arabs. We ran up to Lokichokio, which is in Kenya. From Lokichokio we were transported by the Red Cross to Kakuma Refugee Camp. I returned to Mathiang Dit in the year 2007, in the month of April. And I was very happy to see my mother, my twin brother, my last born [sibling], my sisters; and I was surprised to see them again because I'd be away for 21 years. Not everybody has returned from the war, but every week and every month we get returnees from northern part, eastern Africa, Central Africa. The population of Mathiang Dit boma is 9,983 and the figure of returnees of last year is 350. This year we have got a lot of people but we have not even taken the number. Some came because of the election, but some came because of stress. The life in other parts where they live is very hard. So they decided to come back to cultivate, to be freer with no disturbance. I'm planning to be a teacher. There are a lot of children which I've seen they're not going to school because there's no school. Now we've constructed the school in the boma Mathiang Dit so that this year they have to go to school. My name is Aguer Akec. I returned in January to Mathiang Dit after 22 years away. 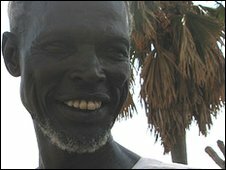 I fled with my wife and children to the north of Sudan because the Arab raiders abducted my cows, goats and burnt my house. But life was hard. I worked as a labourer growing groundnuts near Khartoum. Southerners are not treated well there - you are ordered around, never in a polite way - and if you are not working fast enough they beat you and shout "You are eating for nothing!" I am happy to be back and I hope the south of Sudan will split from the north after next year's referendum. In my 20 year absence my father died - he was tortured and killed by Arab soldiers in Rumaker - and my mother also passed away due to disease. I found my sister still living here in the village, working as a petty trader - and I am staying with her at the moment - with three of my seven children. My wife is in a nearby village until we are able to establish a home. I am an old man now and it is difficult to work, especially for somebody else. One of the main reasons I decided to bring my family back to the south is that I heard that returnees are able to get food from international aid agencies. My name is Gau Yai Deng. I am 35 years old and I returned to Mathiang Dit in February. 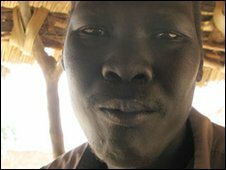 My brother and I fled in 1988 because the Arab raiders where abducting Dinka people and had attacked the village. We were trying to escape to the north, but we were captured on the way by the Arabs. They split us up and we were given to different families to look after cattle. I was seven years old and have never seen my brother since this time. If I ever argued or disobeyed the Arab cattle keepers, they would beat on my head and I was scared of them. I stayed with the same family in the north of this province all these years - even after the 2005 peace deal - because I never had an opportunity to leave. They gave me just a little money in order to eat. The reason I decided to come home is that I heard from some people who had travelled from my village that my mother was now blind. An association for Dinka people in the area heard about my plight and raised the money to pay for my trip. When I arrived in Mathiang Dit I was welcomed by so many people! My mother had heard that I was alive from the returnees coming back from the north who had seen me. I am going to stay here to look after her. So far we are surviving on the little money I make from repairing bicycles and my mother has also started getting some money from Save the Children because she is blind. I am not yet married - I need to get a job first to earn money for the bride price, which is paid in cows. One cow can be between US $300 and US $550 - and I would need 11 cows to marry. My name is Adhel Akot. I am 16 years old and fled Mathiang Dit with my parents when I was young. At the time people and cows were being abducted by Arab cattle raiders and our house was burnt. We went to the north to an area not far from Khartoum, where my parents made money selling firewood. I have three brothers and four sisters - I am the eldest and none of us have ever gone to school. We came back here three years ago because we thought it would be easier for us to grow food. But with a drought one season and the insects attacking our sorghum crop, we have not had much success. It has also been very hard for my family as my father passed away. Two days after we'd arrived back here from the north, he fell ill. He had always suffered from an injury he got as a young man while wrestling - which is a traditional sport here. We took him to the clinic in the neighbouring town, but he died. The community who had just welcomed us back helped us bury him - but it was not a good omen for our return. We all collect firewood like we did in the north and I make tea to sell in the market. In the rainy season I also cultivate the farm. 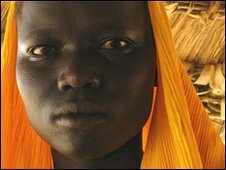 It is better to be here in our native place than in the north, where Dinka people like us have no rights. For example, I remember when some Arabs came to my neighbours and demanded: "We want your boy to come and look after our cattle. After one year we will give you one cow." But the problem in such circumstances is that if you refuse they could kill you and if the boy goes you don't know if he will survive. So I am happy to be here in Mathiang Dit, but really I have no long-term hopes for the future, I just see myself selling firewood. My name is Treza Ayak. My family returned to Mathiang Dit last year. I was actually born in the north of Sudan the year my parents fled - they left because of the 1988 famine caused by the war. Even though I didn't grow up here, the village feels like home because it is our native place and we face no discrimination. We had no family left here but when we returned we were welcomed by the community. They advised us not to leave again - they said it's better to survive on wild fruits like we who stayed during the war than face life as a second class citizen in the north. We were living near Khartoum - I did not go to school and I used to grind okra for Arab farmers - the working conditions were hard. They would also beat us if we did not work hard enough. It is good to be here - the only problem is hunger. I get money to feed my three children by collecting firewood and selling it in the market. My oldest boy is six years old and he will be starting school this year. My husband is in the army - he joined the rebels to fight during the civil war, but he only visits once or twice a year and I get no money from him. I hope the south becomes a separate country after the referendum as had it been before my family would never have had to leave. The stories of the Mathiang Dit villagers echo the experiences of hundreds of thousands of southern Sudanese. Since the 2005 deal which ended the conflict, people have been returning to their homes from across Sudan, as well as neighbouring countries. They have used a variety of different methods - foot, trucks and planes. The village of Mathiang Dit, where the BBC spoke to returnees, is just one example of the impact of the war. It is in the state of Northern Bahr El Ghazal, which has the highest proportion of returnees. Whole familes were forced to flee the fighting and young and old make the return journey in any way possible. Many of the younger generation are "returning" home for the first time.